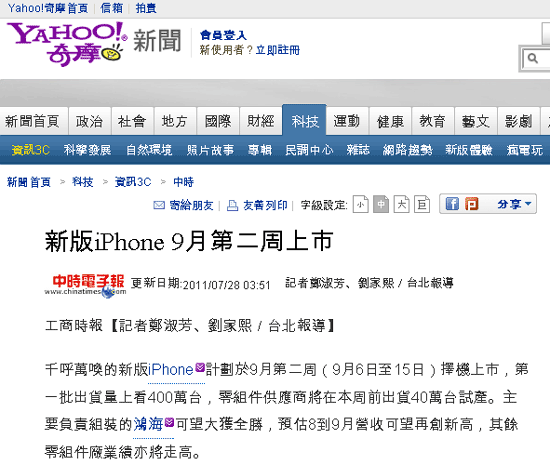 News is coming out of China tonight that the Apple iPhone 5 will be released to the market sometime during the second week of September (September 9 – 15), this according to Yahoo China. Apple is expected to release over 400 million units of the iPhone in the first batch of shipments. And as in standard for Apple with a new iPhone release, this batch will sell out nearly overnight. The Apple iPad 3 (or the iPad HD, depending on what rumor you follow), is no longer expected to be released with the iPhone 5 in September. Shipments for the next generation iPad are now expected to be sometime before Thanksgiving. The iPhone 5 is gearing up to be one of the hottest iterations of the iPhone to date. AT&T is already clearing out iPhone 3 inventory to make way for the new iPhone 5, and Verizon (and Verizon investors) are growing VERY impatient with Apple because, according to Verizon CEO, Apple keeps delaying the iPhone 5 release. The iPad HD coming in Thanksgiving is also a bit of a shock from a shipment standpoint for Apple. It’s been expected that the iPad 3, or iPad HD, would be released with along side of the new iPhone 5. But with an estimated release of “before Thanksgiving”, that would no longer be the case. And the delay of the iPad 3 / iPad HD is something that is sure to not make investors very happy.